LONDON: Quantzig, a leading analytics services provider, has announced the release of their new storyboard on the benefits of leveraging analytics for supply chain and inventory management. Each of these downloadable articles explains how analytics solutions can help companies to optimize their inventory, analyze their real-time supply chain metrics, improve cost structure, and track inventory levels effectively. Companies across industries are facing critical challenges associated with the volume of inventory transactions, the complexity of the analysis needed to identify trends in inventory use, sales, and forecast demand. Leveraging the use of analytics in supply chain and inventory management can help companies to make well-informed business decisions, optimize inventory, improve the bottom line, enhance supply chain flexibility, and optimize resource usage. Quantzig’s analytics solutions have helped companies to identify bottlenecks and supply chain risks by offering insights into real-time data. 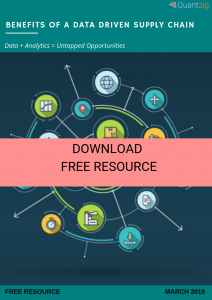 Below, we have summarized some of Quantzig’s free resources and have also highlighted ways in which analytics in supply chain and inventory management has helped businesses to excel in the competitive marketplace. A proper inventory management system can help in optimizing logistics, improving order fulfilment ratios, and increasing operational efficiency. Request a FREE demo to know how our solutions can help. #1: How leveraging analytics help in inventory management? Reducing inventory holdings is a daunting task for businesses but adopting the right inventory optimization strategy can make this task easy. Quantzig’s analytics solutions take warehouse inventory management to the next level through sophisticated algorithms and customized dashboards that make stocking recommendations and offer a holistic approach to assess various demand and supply signals within the supply chain. 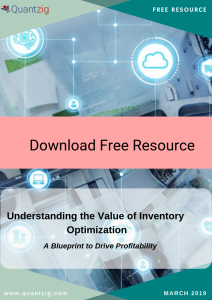 This downloadable free resource offers actionable insights into essential steps to build an inventory optimization strategy. Request a FREE proposal to gain comprehensive insights and achieve long-term benefits through our customized inventory management solutions. #2: What are the best practices for warehouse inventory optimization? Monitoring and maintaining optimal levels of warehouse inventory seems to be a difficult task for businesses. However, businesses that succeed in doing so have been able to boost customer satisfaction rates, drive sales, and set an optimal capital cost structure. 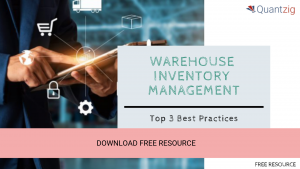 This free resource discusses some of the best practices that determine the most successful approaches to the complex process of inventory management. Also, it highlights some of the essential factors that evaluate the maturity of the processes associated with warehouse inventory management. #3: Transformational impacts of analytics on supply chain: Understanding digital customer behaviors and market trends amidst data explosion have become very challenging for businesses. But leveraging analytics can help in dealing with such challenges head-on by offering valuable insights into supply chain data. Incorporating analytics can impact both the top and bottom-line business results positively. A modern and digital supply chain network backed by the power of analytics can improve inventory management and the entire supply chain operations. Download this free resource to know more about the significant impact of analytics on the supply chain. Want to know how our inventory management solutions can help you optimize the tracking of inventory and materials across the supply network. Get in touch with our experts.